As a man with hair, it’s your God given right to have fun with it and maybe even look good doing so. These are some of the recognizable styles you can achieve as well as a number of other things your mind might dream up. 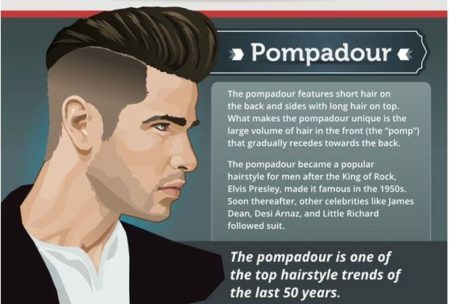 So how do you work with pomade? Here are a few basic points and steps. Scoop out a penny size pearl. If you apply too much in the first pass you might have to start over. I find that it is easier to do 2-3-4 little applications rather than a big nasty one. Pomade doesn’t spread like mousse. So it’s little targeted applications until you are happy. Apply a salt spray or texturizing spray or pre-styling cream in your damp hair and blow dry it. This will create awesome volume and texture that you will tame into shape with the pomade. I personally comb the sides and back, but not my bangs as I like the elevation and the slightly imperfect result of applying the pomade by hand. 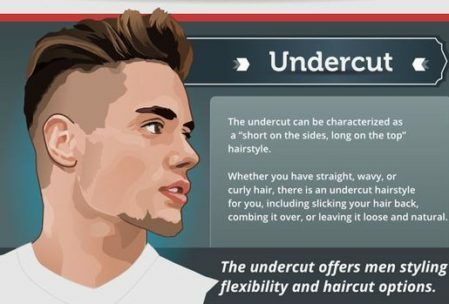 My cut is somewhere between the undercut and the pomp. You now most likely look like a 50’s Greaser, or maybe a 60’s business man or anything in between. Generally speaking, pomade offers a very good hold and you probably won’t have to re-style your do throughout the day. It’s that good. After sleeping on it a night, you might be surprised to see that your style is almost intact. Let’s say you would rather touch it up than wash it again – no problem. Pomade will give a slightly stronger feel on dry hair, so use even less than when your hair was damp. Or alternatively, you can damp your hair a little before applying more pomade. This is not like gel and it does not flake, so you will easily stretch it out 2 days. That is great, but how do I get rid of this goo? Well, here is another beauty of this stuff: it will practically all come out simply by rinsing your hair in the shower. Obviously, shampooing is always best, but might not be entirely essential. Note that this is only true for water-base pomades. The oil and/or petroleum based concoctions are a completely different beast and you will need a proper and specialized shampoo. Otherwise expect to wash your hair 2-3 times to get it all out.